How many pipe smokers have not cast a suspicious glance at that small tin of flake tobacco and said to themselves that they would rather have a �normal� pouch of tobacco - partly because the packet is bigger and partly because you do not have to spend time preparing the tobacco. But this would be to deny yourself a unique tobacco experience. Because a pipe filled the right way with flake tobacco is an extraordinary smoking experience. Throughout my adult life I have been among pipe smokers � the first 23 years as a pipe maker with Georg Jensen Pipes and the last 4 years as �Tobacco Professor� at Mac Baren. During all these years I have very often encountered prejudice among many pipe smokers towards flake tobaccos, and never have I savoured a moment more than when the idea behind flake tobacco is explained to a pipe smoker for the first time, and then he fills his pipe with it and lights it. To see his face slowly transform into an understanding smile, to watch his eyes light up as the taste of a well-prepared flake tobacco pipe provides convincing evidence, is an experience not to be missed. 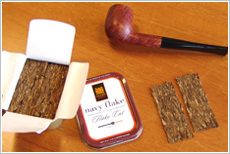 Why are so few pipe smokers familiar with flake tobacco? To find the answer to this question, we must look at how society has developed from the 1800s to the present day. In the last century, when pipe smoking was very common, a father would normally give his son a pipe on his confirmation. The son would draw on the father's experience, ask questions and find out how the various tobaccos should be smoked in order to get the maximum pleasure out of this unique plant that is a product of nature. While pipe smoking is not difficult, good advice passed on by your own father nevertheless proved invaluable. I was such a son, who gained from the experiences of his father just as he had from his father before him. Today, to put it mildly, it is considered �politically incorrect� to give a pipe as a confirmation gift. The giver of such a gift would be the subject of much acrimony, with the result that the �father to son� tradition has all but disappeared. And with the disappearance of this tradition, the experiences gathered by pipe smokers for generations are also being lost. This has inspired me to pass on the experiences I gained from my father to pipe smokers all over the world. Is flake tobacco difficult to smoke? As with every good thing in life, you have to be prepared to devote to it the most valuable thing we have � time. Flake is a tobacco where, as a pipe smoker, I devote the time that it takes to properly prepare a flake tobacco pipe, I enjoy the pleasure of expectation, and I smile with satisfaction as the preparation and expectation turn into sheer enjoyment. Allow me to make one thing clear: there is nothing difficult involved in enjoying flake tobacco. You just have to know what to do. No doubt there are many different ways of smoking flake tobacco and it is not possible to categorically say which is the right one. Here I would like to pass on the advice that I was given, and when you know how flake is produced and the qualities that tobacco takes on when it has been pressed, the advice contained herein will make good sense.